A 0.526 mile short track oval, many stock car fans accept the NASCAR Sprint cup race at Martinsville Speedway as the essence of the sport. The only track under one-mile presented on the final 10 races, the Martinsville Speedway's Tums Fast Relief 500 pits 43 high-horsepower stock cars in tight quarters. Looking for an opportunity to steal the championship away from the dominant Chase leader, Hamlin enters a race track which has become his turf on the NASCAR Sprint Cup tour winning the last two Martinsville races. 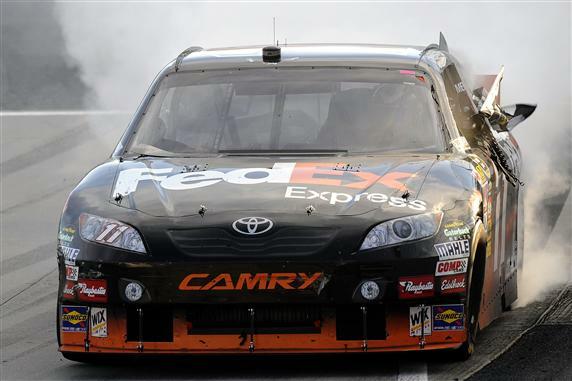 Starting on pole, the #11 FedEx Toyota of Hamlin was positioned immediately to set up a three-peat on the short track. A big qualifying session for Toyota cars, Marcos Ambrose started alongside the Joe Gibbs Racing #11 car. While Denny Hamlin was able to lead the first 10 leads, his Toyota appeared very vulnerable through the much of the races' early laps once front row starter Marcos Ambrose shot to the lead. Tazmania's Ambrose produced a whirl-wind at the front early holding on to the top spot for 40 laps until the race's first caution for the #38 Ford. Presenting the excellent chance for the first pit stops at Martinsville, tires and fuel were taken by everyone on the lead lap. With a fast, coordinated pit stop, the #39 Stewart/Haas Racing car driven by Ryan Newman emerged as the leader in front of David Reutimann's #00 Toyota which himself beat Ambrose out of pit road. As the three cars lead the field back to green on lap 53, it is interesting to note Newman, Reutimann and Ambrose would finish nowhere near the top of the Tums Fast Relief 500. Ryan Newman would lead 32 laps but suffered a rear end gear failure right at the halfway point of the Martinsville race. After being a top 5 contender, work behind the pit wall by the #39 crew was needed to repair the Chevrolet. Newman returned to the track to finish 30th place and 45 laps down to the leader. The Michael Waltrip-backed cars (the #00 of Reutimann and #47 of Ambrose) were both filed to the back of the path with involvement in crashes. Marcos Ambrose was in fact a party in two consecutive cautions on lap 121 and 133. Reutimann lasted up to lap 235 when damaged in an accident with Brad Keselowski. Reutimann could finish 37th while the #47 Toyota would deliver Ambrose home in 34th place. Leading on 5 different occasions between lap 83 to 228, Jeff Burton's #31 Richard Childress Racing-owned Chevrolet showed the same strength that he showed in the spring race at the track. Moving from 18th to become a front runner, Burton wasn't the only RCR driver enjoying a surge in the Tums Fast Relief 500 at the Martinsville short track. Coming from deep in 36th place, Kevin Harvick climbed into the top 10 quickly leading a lap by the 172nd circuit. One of only 97 laps Harvick would lead, the #29 car needed a good points day and would in fact gain ground on the leader of the Chase points. Not restricted to the Richard Childress Racing cars, coming from the back became a regular ritual during the Tums Fast Relief all day. Amongst the most popular of the chargers to the front was the #88 Amp Energy Chevrolet of Dale Earnhardt Jr. Orderly moving into the top 10 through the first half of the race, Earnhardt Jr took the lead on lap 285 passing Hendrick Motorsports teammate Jeff Gordon for the top position under green. Leading for a total of 90 laps, JR Nation had a reason to cheer after more than a month since his last top-10 at New Hampshire. Though the #88 Chevy would diminish from being a top-5 contender late, the team had overall experienced a top-10 day leading into the Talladega race that favours Earnhardt. With 15 cautions occurring through the 500-lap distance at Martinsville Speedway, the close contact mangled not only race machines but the patience of competitors. Enjoying a most productive race, Jeff Burton would leave Martinsville frustrated after the Sunday afternoon action. First criticized by Denny Hamlin for brake-checking on restarts, Burton would himself be displeased with another driver; in fact his teammate Kevin Harvick when the two were making aggressive race contact while at the front. When a caution drew for unrelated issues to the twosome, Harvick mashed his side panels into the #31 Chevy appearing frustrated by Burton's driving. In an immediate post race television interview, Jeff Burton could not rationalize why the #29 car driver is upset of him under the incident musing how his teammate Harvick. "...seems to be the every time it’s a conflict, he’s involved. You would think over the amount of years that he’s done it, that he would get the hint. That he’s always in the middle of it." Burton said. Harvick and Burton's issues disregarded by both drivers on their websites during their post-race reports. A dramatic display between the Richard Childress Racing drivers, both drivers finished in the top-10. This was not the case for the race's highest-profile coming together which involved the #24 Chevy of Jeff Gordon and the #2 Dodge of Kurt Busch. A lap 386 incident, Busch took exception to getting loosened by Gordon's car bumping the #2 car into turn 3. Coming out of turn 4, Kurt Busch's payback resulted in the #24 Chevrolet being turned on the front stretch. Sliding and making minor contact with the inside retaining wall, Busch sent a firm message to Gordon. Suffering ill effects of the spin, the #24 Chevy went from a top-10 race car to finishing 20th place, 2 laps down. As the last interruption of the Tums Fast Relief 500 came between lap 399-402 when the #34 Ford spun, a 98 lap run provided the longest green flag run of the afternoon. Into the final stage of the Tums Fast Relief 500, the race came down to Kevin Harvick and Denny Hamlin. As the #11 Toyota regained his race-winning pace. Leading 86 laps between lap 378 to 470, the #29 Chevy of Harvick was reeled in by Hamlin's Joe Gibbs Racing Toyota under a long green flag run passing for the top position on lap 471. Making an impressive resurgence after a so-so vehicle, Hamlin's run in the #11 Toyota was overshadowed by 51-year old Mark Martin. Driving a #5 Ebay Motors Chevrolet twisted badly by an earlier accident, Martin and his Hendrick Motorsports crew defiantly stayed on the race track. Astonishingly breaking into the top-5 with short track racing battle scars, Mark Martin was realistically the fastest car at Martinsville passing Harvick for the runner-up position in the closing laps. In victory lane, Denny Hamlin celebrated a 3rd consecutive victory at Martinsville Speedway with the #11 Joe Gibbs Racing team. A 7th win of 2010, Hamlin's prosperity on the Virginia state short track allowed him to close within 6 points of Jimmie Johnson within the Chase. Following competition on the slowest track, the NASCAR Sprint Cup Series will race next on the fastest oval on the stock car schedule at Talladega Superspeedway. 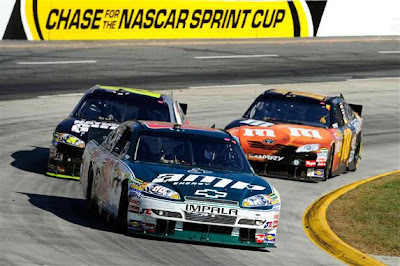 Called a 'Wild Card' race or even "the lottery" by Mark Martin last year, the AMP Energy 500 runs on Halloween Sunday.